What is the greatest resource of a community? Some would say it’s the strength of businesses, others would rate communities by the housing available. And other some look at schools as the resource that drive the qualitity of life in the community. While all of these factors are important, we believe people are the greatest resource of a community. Arlington is made up of a diverse group of people. The diversity within our community gives us strength and presents us with challenges. Diversity gives us the ability to see problems from many different sides and develop solutions many would have never seen. Diversity exposes us to ideas, choices in entertainment, clothing, food, recreation and knowledge that those in a less diverse area would not experience. Our challenge in is to provide to all people in our community the opportunity to thrive, and have support systems to meet their needs. Arlington is large enough, through our collection of neighborhoods to allow diversity to flourish. Young or old, first or fifth generation American, you will find them in Arlington. One community, a diverse people. 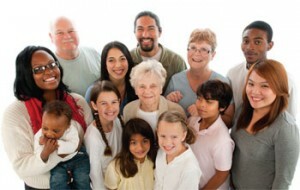 MyArlington.org will always be profiling people in the Arlington community. Geraldine “Gerrie” Dawkins Atkinson has been active in Arlington affairs for over fifty years – and still counting. The consummate “little ’ole lady” in both appearance and demeanor, she is anything but when involved with the numerous Jacksonville and Arlington area issues she’s tackled. She was on the front lines in establishing the City’s tree and landscape protection ordinance, (she’s an unabashed “tree hugger”), and she worked tirelessly in the citizens’ campaign to limit billboards. But it was an issue very close to home that first got Gerrie involved. In 1960, George and Geraldine (Gerrie) Dawkins Atkinson moved to Jacksonville with their two children, Nancy and George III. George Jr. worked for Atantic Coast Line RR and like several fellow railroad employees, left North Carolina for a new house in the new Arlington subdivision, Ft. Caroline Club Estates. In the late 1960s, the subdivision’s developer, Lonnie Wurn proposed to develop the NE corner lot of Ft. Caroline and Rogero Roads as a commercial bank. Gerrie’s persistent protests attracted others to the issue – including her councilperson – and in 1971 Wurn relented and made the corner lot a neighborhood park. Gerrie loved kids and trees, and naturally parks where the two come together. After 10 years of lobbying by Gerrie, the City purchased the corner parcel in in 1982. However, the park was barren and hot, so Gerrie planted oak trees around the park, watering and nurturing the fledging oaks for years. On one day, that care involved a confrontation with City tree trimmers, as Gerrie defiantly stood down the men and their chainsaws to preserve the park’s growing tree canopy. Gerrie’s civic involvement grew as Arlington grew. She was one of the first members of the Greater Arlington Civic Council, and decades later would serve on the Greater Arlington Beaches CPAC, with zoning recreation issues being her passion. She was retired from the City’s Public Library System, and has sang for decades in the church choir at Arlington United Methodist Church, where she and her husband George are long time members. 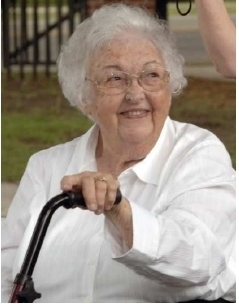 In 2008, the Jacksonville City Council honored Gerri for her advocacy in support of neighborhood parks, and specifically her role in the acquisition and maintenance of the Fort Caroline Playground, by renaming the playground what everybody had been calling it for years – “Gerrie’s Park”. A surprise ceremony unveiled the park’s new signage and name, all under the still-spreading canopy of the trees she had planted. In a 2005 Florida Times-Union interview, she said her goal every day was to have a ball and to help everyone around her have one as well. “She was Dolly Parton, Carol Burnett and Lucille Ball wrapped up into one big ball of fire that loved life,” said her granddaughter, Kandy Kent, who lives in Atlanta. 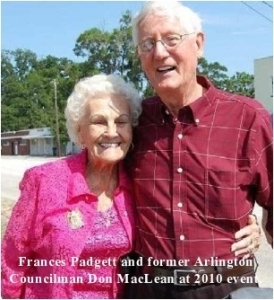 Couple that irrepressible spirit with a tireless record of community service, and the portrait of long-time Arlington civic leader, Frances Padgett begins to emerge. Frances Adell Hungerford Padgett was born in Madison, WI in 1922, and moved to Florida at an early age. In 1939, she graduated from Weirsdale High School in Marion County, and married her husband, Clarence F. Padgett in Baker County. She worked at Western Electric and General Electric for a combined 32 years and later opened her own catering business. Frances and her family moved to Arlington around 1950. She was one of the first people to cross the Mathews Bridge as part of its opening day parade in April, 1953, and sixty years later she would reprise the role for OAI’s Mathews Bridge celebration. As a working mother raising four children, Frances immersed herself in numerous civic and religious activities. They became devout members of the Church of Jesus Christ of Latter Day Saints on Fort Caroline Rd., and her inspirational attitude motivated everyoneshe came into contact with, including the neighborhood children who referred to her as “Nanny Padgett”. Frances served eight terms as president of the Arlington Woman’s Club and served as President of the Arlington Senior Center Advisory Board for 25 years. In 1991, Frances was named as one of ten Volunteers of the Year by first lady Barbara Bush, and in 2001, Mayor John Delaney appointed her as Chairman of the Senior Citizens Elders Council. In 2011, Sheriff John Rutherford awarded Frances with a bronze eagle statue in recognition of her hard work with the Arlington Senior Center, which earlier this year and shortly after her passing, was renamed the Frances Padgett Arlington Senior Center in her honor. “Frances was the Arlington center,” said one board member. Her energy and generosity were as boundless as her zeal for life. She parasailed during summers at Daytona Beach until she was 91, and adopted her own mile that she maintained in front of the senior center. Her giving spirit was evidenced as Mrs. Claus in the neighborhood Christmas parties she was famous for, and she would leave her tree up all year and start wrapping gifts in January, to give to children and everyone who came. Frances volunteered her time to more than twenty groups and organizations, championing not only her Arlington community, but individual people as well. On August 9th 2014, Arlington’s beloved Don Curtis, and “his greatest tag-team partner of all times”Dotty Curtis, were inducted into the Florida Chapter of the National Wrestling and Hall of Fame Museum in Stillwater, OK. Don & Dotty’s daughter Lisa, & grandson JB, stepped up on their behalf toreceive the Lifetime Service to Wrestling Award for their commitment to wrestling. They placed Jacksonville on the map promoting wrestling at the Jacksonville Coliseum where Don was Sports Promotion & Facilities Manager. After his wrestling career, Don was inducted into the University of Buffalo Athletic Hall of Fame for wrestling and football in 1980, and the Professional Wrestling Hall of Fame and Museum in 2009, with tag-team partner Mark Lewin, in the “Tag Team” category. Don & Dotty uniquely shared their love of Family and Community. Revered in the wrestling community and Arlington, they were among the Founders of Old Arlington Inc. and were “gratis” landlords for the group’s original home on Clock Street, which had housed Dotty’s Body Emporium for many years prior. They promoted physical fitness at the Arlington YMCA, the Arlingwood Community Center, and Dotty hosted a regular segment on WFGA’s (Channel 12) TODAY Show. 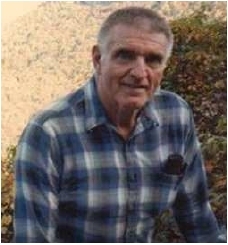 Don was Bishop Kenny’s Volunteer Wrestling Assistant Coach, under Coach Bill Spaulding, for the school’s first wrestling team in 1974. Don & Dotty assisted numerous charitable and civic activities. Arlington has greatly missed Don since he passed on March 6, 2008. Dotty still resides in Arlington today. Don’s wrestling career began at the Univ. of excelled in wrestling, football and academics. After a 20 minute workout with NWA Champion Lou Thesz, Don chose wrestling as his career, and turned down an offer to attend the Baltimore Colts’ training camp. By spring, 1951, he was wrestling in Canada, then later in Australia and New Zealand, under his given name, Don Beitelman. By 1956, Don was back in the U.S. living in Buffalo, NY, and over the next decade would be featured on 1700+ pro wrestling cards, and wrestle in Madison Square Gardens over 50 times. Don made his wrestling debut at the Jacksonville Coliseum in 1961 and changed his last name to “Curtis” in 1967. In between, legendary wrestling announcer Gordon Solie dubbed him, “The Buffalo Bomber”, and in Jacksonville where Don & Dottie now lived he was known as the City’s Favorite Son. Don served on the Wrestling Committee for the Olympic Games in Munich in 1972, and in 1981, was appointed by Mayor Jake Godbold as the Chief of Operations for the City’s Recreation and Public Affairs Dept to oversee the Coliseum, Civic Auditorium, Gator Bowl, and Wolfson Baseball Park. Godbold only had high praise to give Don stating, “He was a true wrestler, not an actor…I don’t know anything that Don took on that he didn’t do in a good manner. He had a good business sense and did an excellent job for us and commanded a great deal of respect”. We join in congratulating Dotty & Don, and are grateful for the many ways they’ve contributed to the community, and for making Arlington their home. 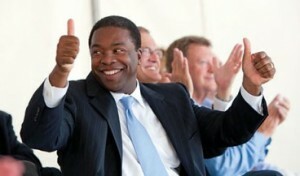 On May 17, 2011 Jacksonville voters chose Arlington resident Alvin Brown to lead the city. He assumed office July 1, 2011. Mayor Brown ran on his vision of “taking Jacksonville to the next level” through job creation, Downtown revitalization, and making education and public safety top priorities. Prior to the election, Mayor Brown served as an Executive in Residence at Jacksonville University’s Davis School of Business. He is the past president and CEO of the Willie Gary Classic Foundation, an organization that helps provide scholarships for historically black colleges. Mayor Brown graduated from Jacksonville University where he earned a Bachelor of Science and a Masters in Business Administration. He also completed postgraduate work at the Kennedy School of Government at Harvard University, and has received an honorary doctorate from Edward Waters College in Jacksonville. Mayor Brown is the recipient of the Frederick Douglass Award from the Southern Christian Leadership Conference, the Excellence in Community Service Award from 100 Black Men of America, the distinguished Award for Government Services from the National Baptist Convention, and the Chairman’s Award from the Congressional Black Caucus. In addition, the National Black MBA Association honored Mayor Brown with the prestigious H. Naylor Fitzhugh Award. Mayor Brown and his wife Santhea have two sons, Joshua and Jordan. Often you can find Mayor Brown hitting a bucket of balls at Blue Cypress Golf Course. Arlington is the kind of community it is because of residents like Alvin Brown.